I don't care about vampires. I appreciate that ever since Bram Stoker introduced Count Dracula in 1897, vampires have been imaginatively used in a variety of fictional vehicles. Each book, movie, TV show, etc. chronicling vampires--Interview with a Vampire, Twilight, Underworld, Buffy the Vampire Slayer, their myriad volumes, offshoots and numerous other examples--deserves to be judged for its own artistic merits, often going well beyond blood-sucking. And to lump them all together would be in vain. 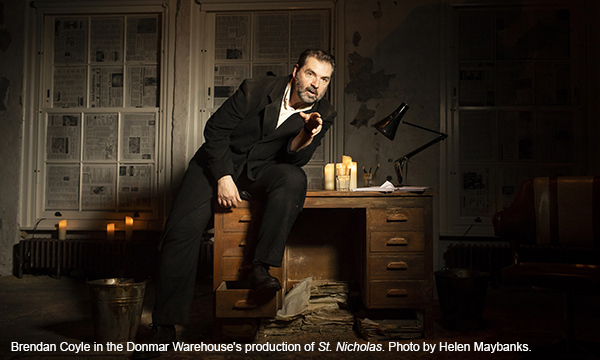 Certainly, Conor McPherson's 1997 play, St. Nicholas--so titled for reasons that escape me--is about much more than vampires. And as it features just a single character, we don't actually see any...unless the man onstage has been bitten and converted, which I won't reveal. 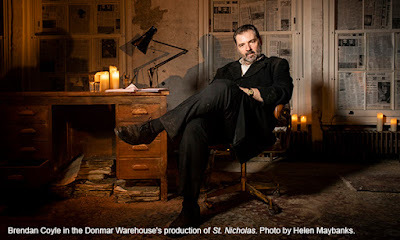 A monologue across two acts, St. Nicholas--now at the Goodman in a production created by London's acclaimed Donmar Warehouse and featuring Brendan Coyle of Downton Abbey fame--spends most of Act I with the unnamed character regaling us about having been a noted theater critic in Dublin. 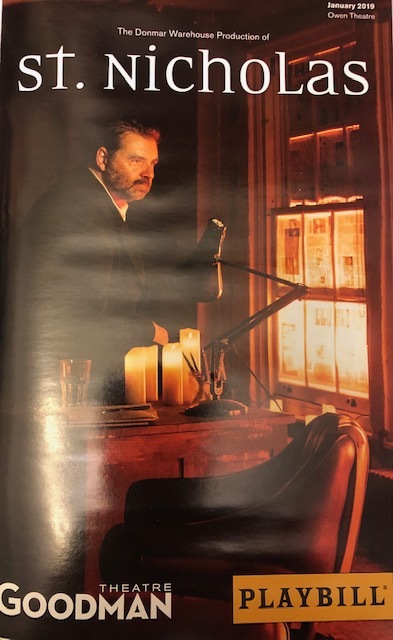 He speaks of his profession, approach and eminence with a mix of ego and ambivalence--plus plenty of enmity for his peers--and having attended the show's Press Night opening, it was fun to imagine some of McPherson's witty lines going over with actual critics. I can't deny having some self-identification when Coyle's critic spoke of having written reviews--at least mentally--before the performance has ended. 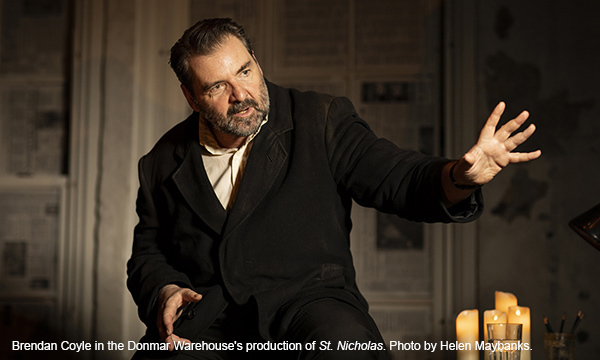 Although I am not a Downton Abbey watcher for whom delight in seeing Brendan Coyle onstage was abetted by familiarity with his supposedly sizable role as a valet named Mr. Bates, he was appreciatively terrific. Better, I perceived, than the play as written. And I've been a Conor McPherson fan since having seen his Dublin Carol at the famed Gate Theater in Dublin in 2000. Soon after I saw The Weir at Steppenwolf in Chicago--Coyle starred in the original London and Broadway productions--and have subsequently seen Shining City, The Seafarer and The Night Alive. Some works have been better than others, and I now view McPherson's oeuvre as a step below his Irish contemporary Martin McDonagh, but they're both in the top rank of contemporary playwrights. Admittedly not always to my loving, McPherson plays often have a supernatural bent. And in this case, I enjoyed--and, probably not inconsequentially, understood and cared about--the first part of St. Nicholas, with the cranky theater critic talking about drunken exploits, encounters and one particular instance of extramarital lust for an attractive actress (who he saw in a version of Salome) considerably more than I did about his interactions with a vampire. I won't reveal exactly when and how the critic meets the vampire, or what happens from there except that it spurs him to head to London, but I also can't say I much cared. Sure, there was likely some allegory going on, about criticism, critics, aging and alcoholism, and probably some comeuppance for the character's widespread contempt. 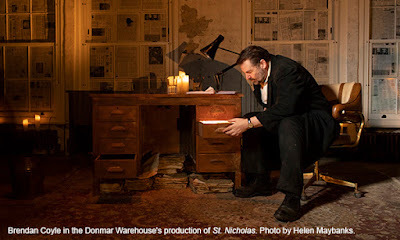 But truly, the main reason it made for a compelling night of theater--beyond the harangues about those who review it--was the performance of Coyle. If you're a big fan of his from the hit PBS series, by all means you should probably catch him here. If nothing else, he's onstage the entire two hours--minus intermission--and barely even pauses for a breath. It's understandable why Donmar resurrected St. Nicholas around Coyle, and why Goodman's Artistic Director Robert Falls jumped at the chance to share it with Chicago audiences. It's hard to envision anyone playing this role any better. And while I didn't wind up a huge fan of the play--or its take on vampires--I remain an admirer of the playwright, and newly appreciative of a TV star that any critic can see is quite at home in the theater.